EDM Services has enjoyed over a decade long continued business relationship with this customer. 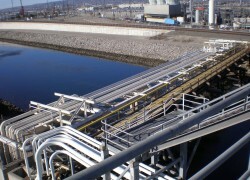 One project included the design and permitting of the $2,000,000 Dominguez Channel Pipe Bridge and Interconnecting Piping Project. This project included a major structural steel bridge across the channel, underground corrugated metal tunnel structures beneath railroad facilities, large reinforced concrete vaults, and all interconnecting piping.